The Rupert/Pope/Anderson series is unsurpassed in blending technical aspects of the most recent federal taxation mandates with maximum readability and relevance for readers. 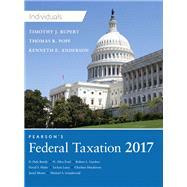 Containing strong pedagogical tools that enable readers to apply tax principles within the text to real-life situations, and tax information from 2015 and early 2016, Pearson's Federal Taxation 2017 Individuals, Thirtieth Edition provides a better learning experience. Note: You are purchasing a standalone product; MyAccountingLab does not come packaged with this content. Students, if interested in purchasing this title with MyAccountingLab, ask your instructor for the correct package ISBN and Course ID. Instructors, contact your Pearson representative for more information. Timothy J. Rupert is a Professor and the Golemme Administrative Chair at the D’Amore-McKim School of Business at Northeastern University. He received his B.S. in Accounting and his Master of Taxation from the University of Akron. He also earned his Ph.D. from Penn State University. Professor Rupert’s research has been published in such journals as The Accounting Review, The Journal of the American Taxation Association, Behavioral Research in Accounting, Advances in Taxation, Applied Cognitive Psychology, Advances in Accounting Education, and Journal of Accounting Education. He currently is the co-editor of Advances in Accounting Education. In 2010, he received the Outstanding Educator Award from the Massachusetts Society of CPAs. He also has received the University’s Excellence in Teaching Award and the D’Amore-McKim School’s Best Teacher of the Year award multiple times. He is active in the American Accounting Association and the American Taxation Association (ATA) and has served as president, vice president, and secretary of the ATA. Thomas R. Pope is the Ernst & Young Professor of Accounting at the University of Kentucky. He received a B.S. from the University of Louisville and an M.S. and D.B.A. in business administration from the University of Kentucky. He teaches international taxation, partnership and S corporation taxation, tax research and policy, and introductory taxation and has won outstanding teaching awards at the University, College, and School of Accountancy levels. He has published articles in The Accounting Review, the Tax Adviser, Taxes, Tax Notes, and a number of other journals. Professor Pope’s extensive professional experience includes eight years with Big Four accounting firms. Five of those years were with Ernst & Whinney (now part of Ernst & Young), including two years with their National Tax Department in Washington, D.C. He subsequently held the position of Senior Manager in charge of the Tax Department in Lexington, Kentucky. Professor Pope also has been a leader and speaker at professional tax conferences all over the United States and is active as a tax consultant. Kenneth E. Anderson is the Pugh CPAs Professor of Accounting at the University of Tennessee. He earned a B.B.A. from the University of Wisconsin—Milwaukee and subsequently attained the level of tax manager with Arthur Young (now part of Ernst & Young). He then earned a Ph.D. from Indiana University. He teaches corporate taxation, partnership taxation, and tax strategy. Professor Anderson also is the Director of the Master of Accountancy Program. He has published articles in The Accounting Review, The Journal of the American Taxation Association, Advances in Taxation, the Journal of Accountancy, the Journal of Financial Service Professionals, and a number of other journals.